Below you fill find all funeral homes and cemeteries in or near Moundridge. 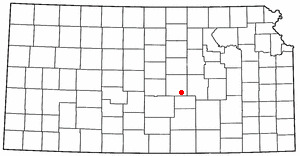 Moundridge is also known as: McPherson County / Moundridge city. Zip codes in the city: 67107. Some of the notable people born here have been: (gilbert galle). Moundridge is a city in McPherson County, Kansas, United States. As of the 2010 census, the city population was 1,737. The city is named for the settlement that became the incorporated city in 1887 located in Mound Township. It was revealed by Hutchinson News on March 14th, 2019 that Ruby Maxine Graber (Kaufman) died in Moundridge, Kansas. Ms. Graber was 91 years old. Send flowers to express your sorrow and honor Ruby Maxine's life. It was reported by Hutchinson News on March 5th, 2019 that Verna Goering (Kaufman) perished in Moundridge, Kansas. Ms. Goering was 103 years old. Send flowers to share your condolences and honor Verna's life. It was reported by Hutchinson News on March 1st, 2019 that Selma miss Koehn perished in Moundridge, Kansas. Koehn was 101 years old. Send flowers to express your sympathy and honor Selma miss's life. It was written by Hutchinson News on February 26th, 2019 that Arlene M Stucky-Thiesen (Zerger) passed away in Moundridge, Kansas. Ms. Stucky-Thiesen was 87 years old. Send flowers to express your sorrow and honor Arlene M's life. It was reported by Hutchinson News on February 4th, 2019 that C Glen Schmidt died in Moundridge, Kansas. Schmidt was 85 years old. Send flowers to express your sorrow and honor C Glen's life. It was disclosed by Hutchinson News on January 15th, 2019 that Dorothy M Kreibiel (Neufeld) perished in Moundridge, Kansas. Ms. Kreibiel was 86 years old. Send flowers to express your sympathy and honor Dorothy M's life. It was revealed by Hutchinson News on December 21st, 2018 that Verna Pearl Goering (Kaufamn) passed on in Moundridge, Kansas. Ms. Goering was 89 years old. Send flowers to express your sorrow and honor Verna Pearl's life. It was written by Hutchinson News on December 17th, 2018 that Dorothy J Tillock (Welty) perished in Moundridge, Kansas. Ms. Tillock was 86 years old. Send flowers to express your sorrow and honor Dorothy J's life. It was disclosed on November 20th, 2018 that Paul Henry Siemens passed away in Houston, Texas. Siemens was 52 years old and was born in Moundridge, KS. Send flowers to express your sorrow and honor Paul Henry's life. It was disclosed by Hutchinson News on November 12th, 2018 that Vern K Goering perished in Moundridge, Kansas. Goering was 70 years old. Send flowers to express your sympathy and honor Vern K's life. Between 1874 and 1880, of the approximately 45,000 Mennonites who had been living in South Russia, 10,000 departed for the United States and 8,000 for Manitoba. The population was 1,593 at the United States Census, 2000 census. The city is named for the settlement that became the incorporated city in 1887 located in Mound Township. The Moundridge area was settled by Mennonites soon after the completion of the transcontinental railroad in 1869. The Adobe House Museum in nearby Hillsboro, Kansas and the Mennonite Settlement Museum in nearby Goessel, Kansas demonstrate the lives and times of these early settlers. Since the central part of the state was settled, Kansas has enjoyed the reputation as the top wheat-producing state. The official website for the city of Moundridge is http://www.Moundridge.com. flowers for Moundridge, KS. Find phone numbers, addresses, maps, driving directions and reviews for flowers in Moundridge, KS. The finest roses, gifts and Mother's Day flowers delivered fresh. Serving Moundridge, Kansas, surrounding suburbs and the entire country. We work with local florists and flower shops to offer same day delivery. You will find budget sympathy flowers in Moundridge here. Our funeral flowers are cheap in price but not in value.